Learn more about the Roleplay Activity Cards here! 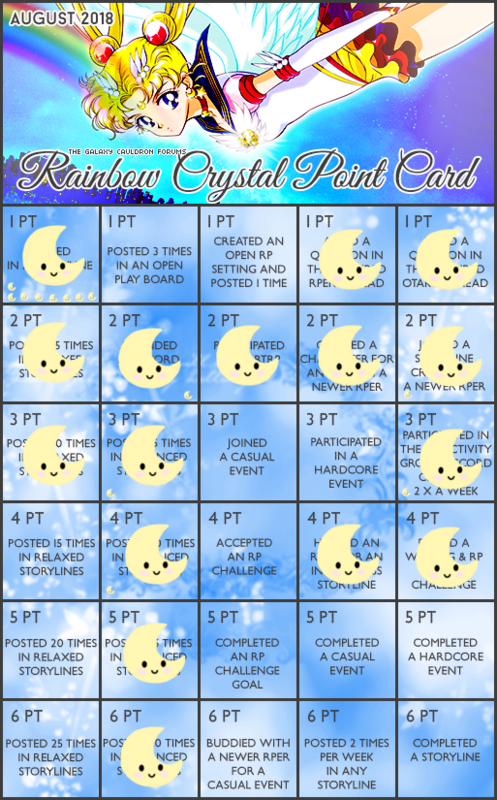 The first card shown is not for Rainbow Crystal Activity Stamp holders; please scroll down for the second card. 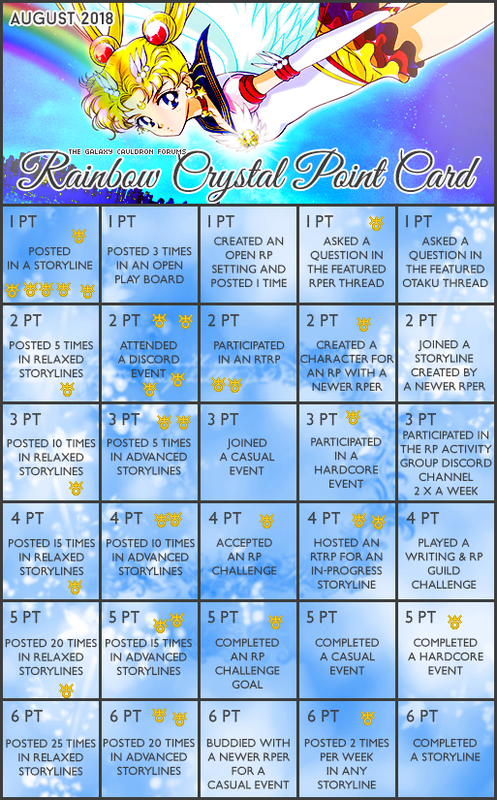 --Posts tallied monthly by the Moderators will be updated in this Roleplay Activity Card thread at the end of the month! "Brand New" means a Storyline created in August. "In-Progress" is any Storyline created prior to August. All boxes other than the [Relaxed]/[Advanced] post counts can be counted multiple times if completed multiple times. --For Example: if WorldShaking joins two brand new Storylines, she can mark the "Joined a Brand New Storyline" box twice and get double the points! If she joined three, she can check it off three times and triple that box's point score. --However, if DeepSubmerge posted 30 times in a [Relaxed] Storyline, she counts all [Relaxed] post count squares up to the 25 count square (2, 3, 4, 5, 6 for a total of 21 points) and then goes back and checks "Posted 5 times in a [Relaxed] Storyline" again, for a total of 23 points. Don't mark off the "5 [Relaxed] post" 6 times... It doesn't earn as many points. Submitting a Roleplay Activity Card is optional, however, it is the only way to accrue Points for Roleplaying! RP Activity Points are transferred to GC Points in a 1:5 Ratio. For Example: You earned 50 RP Activity points! That's 250 GC Points! You can also claim an RP Activity Point Stamp for your stamp collection! Stamp colors are decided monthly. Collect all 7 and level up! When you have all 7, PM ♅ Sailor Uranus! Two shards make a crystal if the total combined points from the two shard cards exceeds 1.5x the points to earn the full crystal. For example, if you got 19 points for this light blue stamp, and in 7 months earn another 29 points and would earn a second shard, then in total you have 48 points from those two cards! That's greater than 1.5x30 (which is 45) so you could claim the stamp!! Only Rainbow Crystal Activity Stamp holders may use this card! "Newer Roleplayers" includes anyone who does not possess a Rainbow Crystal Stamp yet! --Please try to help out "brand new" members to the RP Section, if possible! "Completed a Brand New Storyline" means that, within a month, you started and finished a Storyline! "Buddied with a Newer Roleplayer [Casual Event]" means that, in the RP or behind the scenes, you made sure a newbie wasn't left behind! Storyline RTRP's should move in-progress Storylines along; this could be through a side-conversation between characters, acting out a fight scene, or doing a lot of RPing in a short period of time to keep the Storyline flowing. 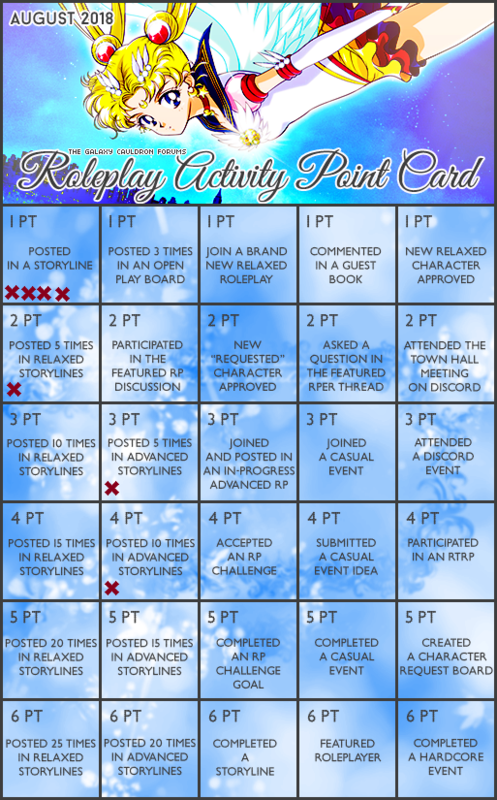 1) Using your Storyline's OOC thread/chat, figure out a time that works best for the players involved with the RTRP. 3) When the RTRP has completed, you, the host, must record it in the Storyline thread as a new post, reformatting as necessary to make it easy to read for anyone reviewing your thread! This may include changing font styles, fixing weird spacing that Discord likes to include, updating images, or pasting all as plain text and reformatting all the text for italics, etc. Questions? Comments? Suggestions for new Rainbow Crystal+ squares? PM ♅ Sailor Uranus or send a message on Discord! Need help filling out an Activity Card? Reach out to ☿ Sailor Mercury, via PM or Discord message! To collect the points and stamp for the card, your reply must be submitted by: Saturday, September 15! Don't delay! Please note! If you do not see your name on the list or if you think the count is off, please message me either on the forum or via discord dm!